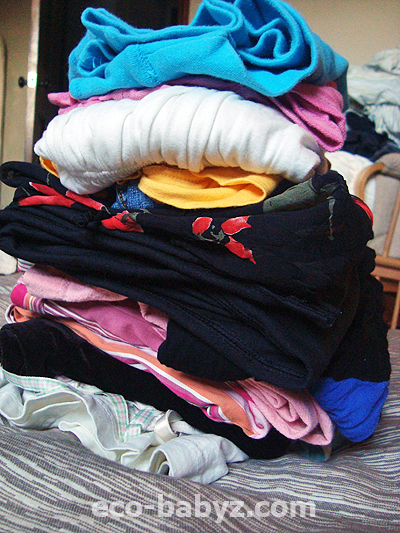 That's my little pile of unwanted clothing. Finally. It's small, it's just 22 items, but I'm just getting started! Clothing is something I want to get rid of most because it takes up the most space and causes the most headache at the moment. How much do you really need? I find that I wear about 20% of my clothing - at most, probably even less. A lot of it has to do with working from home, of course. But I do not anticipate working outside the home for the next 18 years at least (while we homeschool). So do I really need three business jackets? I think I'll manage with one. Do I need five pairs of dress pants? Most certainly not, especially not the ones that no longer fit my mama hips! After I'm done with the clothing, toys are next on my list! What a nightmare. This eco-friendly, wooden toy loving family is inundated with plastics galore from well meaning friends and family. Some of the stuff is never played with and has to go before we drown in 'Made.In.China'. I think when it comes to 'stuff', plastic toys are my pet peeve, I nearly loose sleep over it. How do you deal with too many toys? Even if you never buy any but friends and family do? To anyone celebrating Easter or Passover, have a wonderful holiday and a great time with family and friends! I have a lot of plastic toys still, do they all get played with at all times? Probably not, but once in a while they do, and I'm not worrying about it so much, after all we don't live in a perfect world and replacing all the toys i already have is the last thing on my mind, i do go through them once in a while and they get thrown away the broken once.